I'm not going to lie - I still can't get used to seeing Venla Hovi in red. 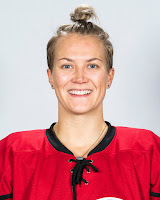 Regardless of my struggle with the colour of her jersey, she is doing a heckuva job with the Calgary Inferno as she ventures into her first professional hockey season. Venla is, of course, gearing up to represent her home nation of Finland at the Four Nations Cup in Saskatoon from November 6-10, so seeing her elevate her game against some of the best players on the planet is a good thing! A week ago, I posted the grainy, hard-to-see video of her first goal on a deflection past Noora Raty. Today, Hovi doubled her goal-scoring output as she and her Inferno teammates took on the Worcester Blades! Hovi, as far as we saw in U SPORTS play, never had a problem finding the back of the net, but playing against names like Raty, Lacasse, Chuli, and Howe should have her rolling when she pulls on the Finland jersey in a couple of weeks. Today, against the Blades, we saw Hovi strike again as she went to a high-danger scoring area once more! As the Worcester broadcaster stated, Hovi came flying in off the bench into the slot area, took the pass from Brigitte Lacquette, and hammered the puck home high past former Maine Black Bears netminder Mariah Fujimagari for her second goal of the year! The fact that no one picked up Hovi as she came off the bench and cruised into the zone might be an indication of a little puck-watching being done by the Blades, but the end result was the Blades fishing the puck out of the back of their net for the fourth time today. The former Bisons winger is looking great with her new squad in Calgary, and I'm hoping she makes a lasting impact this season and in future seasons in the CWHL. If she keeps scoring goals like she has on consecutive weekends, I'm pretty sure she'll be in Inferno colours for a long time.